The print, including the background, is 4 1/2" x 5 1/2". HARRISON FISHER. All of our prints are bevel matted in a very high quality, and simple off-white/ivory matting. He was born inBrooklyn ,New York City but spent most of his youth inSan Francisco until he turned 21 years old. TEXT: NAUGHTY, NAUGHTY. The print, including the background, is 4" x 5 1/4". HARRISON FISHER. All of our prints are bevel matted in a very high quality, and simple off-white/ivory matting. He was born inBrooklyn ,New York City but spent most of his youth inSan Francisco until he turned 21 years old. DEPICTING ~ A beautiful Harrison Fisher girl, at the opera, wearing a pink ribbon in her hair. FROM ~ The Archive of the Old Print Man ~ Bachelor Belles by Harrison Fisher, 1908, New York. TITLE ~ untitled - by Harrison Fisher. FROM ~ The Archive of the Old Print Man ~ Bachelor Belles by Harrison Fisher, 1908, New York. DEPICTING ~ A beautiful Harrison Fisher girl, with a pink ribbon in her hair. TITLE ~ untitled - by Harrison Fisher. FROM ~ The Archive of the Old Print Man ~ Bachelor Belles by Harrison Fisher, 1908, New York. TITLE ~ untitled - by Harrison Fisher. CONDITION ~ Minor and normal signs of age. PAGE SIZE ~ Approx. FROM ~ The Archive of the Old Print Man ~ Bachelor Belles by Harrison Fisher, 1908, New York. DEPICTING ~ A beautiful Harrison Fisher girl, in a blue dress, and a big floppy hat. TITLE ~ untitled - by Harrison Fisher. The Song of Hiawatha by Henry Wadsworth Longfellow. Harrison Fisher's distinctive signature is small, but clearly visible in the images. Very nice for framing. WONDERFUL LITHOGRAPH FEATURING A LOVELY BLONDE "GIRL" BY FAMOUS ARTIST HARRISON FISHER TITLED "Little Girly-Girl". PICTURE IS SHOWN HERE IN A LIGHT COLORED SAMPLE MAT BOARD (pic. #4); AND IN A DARK COLORED MAT BOARD (pic. ). The Song of Hiawatha by Henry Wadsworth Longfellow. One includes a chapter title, "The White Man's Foot". Harrison Fisher's distinctive signature is clearly visible in the images. Very nice for framing. The print, including the background, is 4 1/4" x 5". HARRISON FISHER. All of our prints are bevel matted in a very high quality, and simple off-white/ivory matting. He was born inBrooklyn ,New York City but spent most of his youth inSan Francisco until he turned 21 years old. The Song of Hiawatha by Henry Wadsworth Longfellow. This lot includes five prints, all of which seem to focus on death, sacrifice, or spirituality. Harrison Fisher's distinctive signature is small, but clearly visible in the images. TITLE ~ How Pleasant It Is To Have Money. by Harrison Fisher. CONDITION ~ Minor and normal signs of age. DEPICTING ~ A beautiful Harrison Fisher girl with a black ribbon on her bonnet. FROM ~ The Archive of the Old Print Man ~ Bachelor Belles by Harrison Fisher, 1908, New York. TITLE ~ untitled - by Harrison Fisher. DEPICTING ~ A beautiful Harrison Fisher girl, in a black dress and feathered hat. 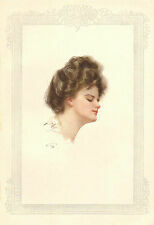 FROM ~ The Archive of the Old Print Man ~ Bachelor Belles by Harrison Fisher, 1908, New York. TITLE ~ untitled - by Harrison Fisher. FROM ~ The Archive of the Old Print Man ~ Bachelor Belles by Harrison Fisher, 1908, New York. DEPICTING ~ A beautiful Harrison Fisher girl, in portrait view of her face. TITLE ~ untitled - by Harrison Fisher. The pages are in very good condition with only traces of aging or wear. Printed on substantial, slightly glossy paper. Very suitable for framing. The Song of Hiawatha by Henry Wadsworth Longfellow. This lot includes two prints, both focusing on Picture Writing. Harrison Fisher's distinctive signature is small, but clearly visible in the images. FROM ~ The Archive of the Old Print Man ~ Bachelor Belles by Harrison Fisher, 1908, New York. TITLE ~ untitled - by Harrison Fisher. CONDITION ~ Minor and normal signs of age. Minor binding residue on the left edge, can be covered with the mat. Antique, bevel-matted print from an old book of drawings, "THE LITTLE GIFT BOOK," by Harrison Fisher, published in 1913. The print, including the background, is 3 1/2" x 6". HARRISON FISHER. All of our prints are bevel matted in a very high quality, and simple off-white/ivory matting. Antique, bevel-matted lithograph from an old book of drawings, "BACHELOR BELLES," illustrated by Harrison Fisher, and published in 1908. The print, including the border, is 5 1/2" x 8 1/2". HARRISON FISHER. FROM ~ The Archive Of The Old Print Man. CONDITION ~ Minor and normal signs of age. 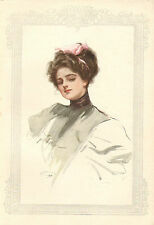 WONDERFUL LITHOGRAPH FEATURING LOVELY YOUNG "BELLE" BY FAMOUS ARTIST HARRISON FISHER. PICTURE IS SHOWN HERE IN A LIGHT COLORED SAMPLE MAT BOARD WITHOUT THE BORDER INCLUDED (pic. #4); AND IN A DARK COLORED MAT BOARD (pic. ). Antique, bevel-matted lithograph from an old book of drawings, "BACHELOR BELLES," illustrated by Harrison Fisher, and published in 1908. The print, including the border, is 5 1/2" x 9 1/2". HARRISON FISHER. 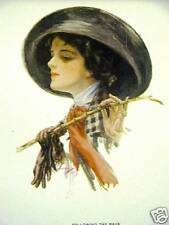 DEPICTING ~ A beautiful Harrison Fisher girl, in a black hat and Black feathered hat. 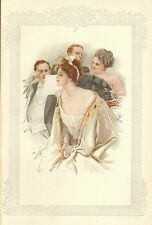 FROM ~ The Archive of the Old Print Man ~ Bachelor Belles by Harrison Fisher, 1908, New York. TITLE ~ untitled - by Harrison Fisher. The print, including the background, is 4 1/2" x 5 1/2". TEXT: REFLECTIONS. HARRISON FISHER. All of our prints are bevel matted in a very high quality, and simple off-white/ivory matting. He was born inBrooklyn ,New York City but spent most of his youth inSan Francisco until he turned 21 years old. The print, including the background, is 6 1/2" x 8 1/2". HARRISON FISHER. All of our prints are bevel matted in a very high quality, and simple off-white/ivory matting. He was born inBrooklyn ,New York City but spent most of his youth inSan Francisco until he turned 21 years old. The print, including the border, is 8" x 10 1/4". HARRISON FISHER. All of our prints are bevel matted in a very high quality, and simple off-white/ivory matting. He was born inBrooklyn ,New York City but spent most of his youth inSan Francisco until he turned 21 years old. All of our prints are bevel matted in a very high quality, and simple off-white/ivory matting. The print, including the border, is 8" x 10 1/4". HARRISON FISHER. JUST AS DESCRIBED. GREAT MATTING! TEXT: THE HONEYMOON. The print, including the background, is 4 1/4" x 5". HARRISON FISHER. He was born inBrooklyn ,New York City but spent most of his youth inSan Francisco until he turned 21 years old. Antique, bevel-matted lithograph from an old book of drawings, "BACHELOR BELLES," illustrated by Harrison Fisher, and published in 1908. The print, including the border, is 4 3/4" x 7 1/2". HARRISON FISHER. TEXT: Miss Knickerbocker. The print, including the background, is 4 1/2" x 5 1/2". HARRISON FISHER. All of our prints are bevel matted in a very high quality, and simple off-white/ivory matting. He was born inBrooklyn ,New York City but spent most of his youth inSan Francisco until he turned 21 years old. TEXT: THE DEBUTANTE. The print, including the background, is 4 1/2" x 5 1/2". HARRISON FISHER. All of our prints are bevel matted in a very high quality, and simple off-white/ivory matting. He was born inBrooklyn ,New York City but spent most of his youth inSan Francisco until he turned 21 years old. TEXT: NAUGHTY, NAUGHTY. The print, including the background, is 4" x 6 1/2". HARRISON FISHER. All of our prints are bevel matted in a very high quality, and simple off-white/ivory matting. He was born inBrooklyn ,New York City but spent most of his youth inSan Francisco until he turned 21 years old. The print, including the background, is 4 1/2" x 5 3/4". HARRISON FISHER. All of our prints are bevel matted in a very high quality, and simple off-white/ivory matting. He was born inBrooklyn ,New York City but spent most of his youth inSan Francisco until he turned 21 years old. The print, including the background, is 4 1/2" x 6". HARRISON FISHER. All of our prints are bevel matted in a very high quality, and simple off-white/ivory matting. He was born inBrooklyn ,New York City but spent most of his youth inSan Francisco until he turned 21 years old. Antique, bevel-matted lithograph from an old book of drawings, "BACHELOR BELLES," illustrated by Harrison Fisher, and published in 1908. HARRISON FISHER. He was born inBrooklyn ,New York City but spent most of his youth inSan Francisco until he turned 21 years old. The print, including the background, is 4 1/2" x 5 3/4". HARRISON FISHER. He was born inBrooklyn ,New York City but spent most of his youth inSan Francisco until he turned 21 years old. He then moved back to. The print, including the background, is 4 3/4" x 6 1/4". HARRISON FISHER. All of our prints are bevel matted in a very high quality, and simple off-white/ivory matting. He was born inBrooklyn ,New York City but spent most of his youth inSan Francisco until he turned 21 years old. The print, including the background, is 4 3/4" x 6". HARRISON FISHER. All of our prints are bevel matted in a very high quality, and simple off-white/ivory matting. He was born inBrooklyn ,New York City but spent most of his youth inSan Francisco until he turned 21 years old.